The warp and weft of the loom has attracted nationally renowned textile designer (from Guwahati) Anannya Sharma since her childhood when she used to see her “grandmothers working on the loom and after the laborious process taking out a product which is so soft and organic”. Since then, weaving is like a meditative practice for this Assamese designer and she finds the whole process very rhythmic and for her the loom has a wonderful sonorous quality. The process and enthusiasm of creating a new product – taking it out of the loom and waiting to have it in her hands and share it with the weaver – is what inspires her to keep working hard on her craft – designing: Almost like an addiction. Anannya, who started her career with a designing studio in Mumbai in the year 1988, has come a long way since then. Today, she is empanelled as a designer under the Ministry of Textiles, Government of India, and gives training in skill development and product diversification to the weavers. Presently, she is working under the Government of Meghalaya in a cluster near Garo Hills. 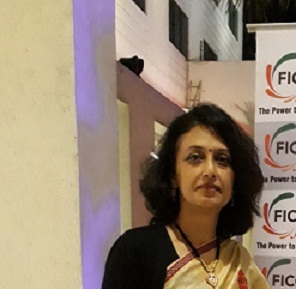 She has also worked under various Government agencies like SIRD, NEDFi, KVIC, etc., on various projects in places like Gohpur and Sivasagar and in NE States like Sikkim, Nongpoh (Meghalaya) and Arunachal Pradesh. Yarn Glory’s business model involves capacity building of indigent women weavers to generate livelihood by imparting improved methods of weaving skills, adopting modified designs, unique colour schemes and creating a range of diversified products which are urban market-friendly. In the process, she seeks to promote women’s empowerment and financial independence for the weavers. Her significant achievement is to introduce household furnishings in handloom like place rugs, runners, table mats, tea cosies and durries and these works of hers have strong influences of traditional or ethnic art imprinted on them.